Flag ceremonies are a long-standing Girl Scout tradition that honors the American flag as the symbol of our country and all the hopes, dreams, and people it represents. Our camps have begun and ended each day with the raising and lowering of the flag for decades and this is an iconic Girl Scout moment for many of our members. If you’re new to Girl Scouts or need a refresher on the essential elements of a flag ceremony, check out this Flag Ceremonies resource our staff created. Why not take part in this tradition by adding a flag ceremony to your next troop meeting or Girl Scout event? While there are many different reasons to hold a flag ceremony, they all share one essential thing – respect for the flag. One of the most meaningful ways to show respect for the flag is by participating in a flag retirement ceremony. When do flags retire? According to the U.S. Flag Code when a flag is “in such condition that it is no longer a fitting emblem for display, it should be destroyed in a dignified way, preferably by burning”. This is often called a flag retirement ceremony and while the U.S. Flag Code does not provide an outline for this ceremony, UShistory.org gives us general guidelines for retiring a flag in a ceremony of final tribute before a ceremonial burning. We’ve included their recommendations below. Remember that as with all flag ceremonies, it is best to keep it simple and place the emphasis on respect for the flag rather than on the commands or techniques. Only one flag should be used in the ceremony, which is representative of all the flags to be burned in the service. The remainder of the flags collected should be incinerated. The ceremony should be conducted out-of-doors, preferably in conjunction with a campfire program, and it should be very special. The ceremony involves two color guards, one for the flag currently in use and a special color guard for the flag to be retired from service. Of course, this may be adapted if conditions necessitate. Just before sunset the flag which has been flying all day is retired in the normal ceremonial procedure for that location or group. Call the group to attention. Lead the entire group in the Pledge of Allegiance to the Flag. Order the flag retired by the color guard. It is important that the fire be sizable — preferably having burnt down to a bed of red hot coals to avoid bits of the flag being carried off by a roaring fire — yet be of sufficient intensity to ensure complete burning of the flag. The color guard assigned to the flag opens up the tri-corner fold and then refolds the flag in a coffin-shaped rectangle. Some groups choose to cut the flag into smaller pieces (cutting along the blue field and separating each stripe) as part of the ceremony. This is permissible but not required. Assemble around the fire. The leader calls the group to attention. The color guard comes forward and places the flag on the fire. After the salute, but while still at attention, the leader should conduct a respectful memorial service as the flag burns. National Flag Foundation recommends singing “God Bless America” followed by an inspiring message of the flag’s meaning followed by the “Pledge of Allegiance” and then silence. When the flag is basically consumed, those assembled, with the exception of the leader and the color guard, should be dismissed single file and depart in silence. The leader and the color guard remain until the flag is completely consumed. The fire should then be safely extinguished and the ashes buried. 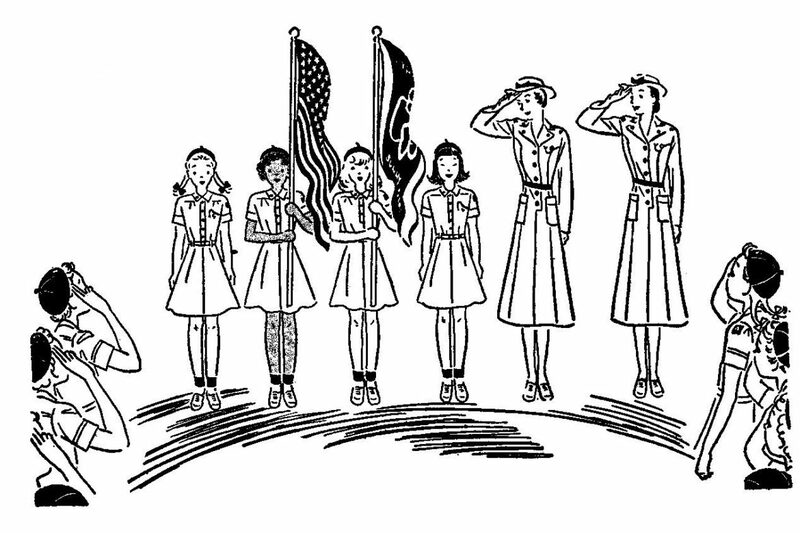 We hope you find these guidelines and resources helpful and that you will join Girl Scouts across the nation and throughout our history in honoring our nation’s flag by participating in a special ceremony like those above.